LDS Patriot | Engagement and discussion of news, politics & LDS (Mormon) apologetics. I just saw the movie Risen. Wonderful! Probably the first movie about Christ I’d give a 10. Having been touched by Christ and the Holy Ghost, I too will never be the same. Jesus is the Risen Lord. I know it to be true. He lives! Jesus and God the Father appeared to Joseph Smith. I know it to be true! They live! We will be resurrected. I know it to be true. We live! I enjoy and am grateful for the Church’s manuals Duties and Blessings of the Priesthood, Part A & Duties and Blessings of the Priesthood, Part B. When taking business management classes at the University, I was especially intrigued and drawn to Expectancy theory. Applying Expectancy theory to the gospel, I desire to magnify the priesthood, which will bless the lives of my family and those I serve, while ensuring exaltation. I need to know what the priesthood is and how to magnify my callings, hence this personal study. The Spirit of the Lord was undoubtedly present as they received the priesthood by the laying on of hands from those with authority. I remember much about of the day I was ordained an Elder in The Church of Jesus Christ of Latter-day Saints. Reflecting upon that day always warms the heart and brings a smile to my face. To be sure, it was one of the spiritual highlights of my life. Sitting on stage in the cultural hall of the church, I was surrounded by over a dozen friends and family. The officiator started by saying “let’s lighten up on the pressure, we don’t want to break his neck!” I recall that I received council to work out physically, and metaphorically spiritually. The officiator didn’t know me, and I marveled how perfect such an metaphor meant to me at the time because I was intensely engaged in martial arts and body building. He said I was to be a witness to the world and would have the gift of tongues. The officiator couldn’t have know such language was in my patriarchal blessing and that on two or three occasions in the past I had actually spoken to strangers to comfort them in their native tongue, which languages I did not know. He blessed me to have power in the priesthood to heal people from their sickness and afflictions, and this has come true many times. Other blessings and prophecies were pronounced, yet what I remember most was such a loving outpouring of the Spirit of the Lord, being baptized in the Holy Spirit. The priesthood is God’s eternal power and authority. God accomplishes His work by the priesthood. How did God get his priesthood? He was ordained by his Father, an eternal pattern. President Joseph Fielding Smith said: “We are the Lord’s agents; we represent him; he has given us authority which empowers us to do all that is necessary to save and exalt ourselves as well as his other children in the world. “We are ambassadors of the Lord Jesus Christ. Our commission is to represent him. We are directed … to do what he would do if he were personally present” (in Conference Report, Apr. 1971, 47; or Ensign, June 1971, 49). A humbling reality to know one is an agent of the Lord. When I was ordained, the officiator handed me his line of authority. I’ve since then lost it. Because I ordained my son to the Aaronic Priesthood, it’s a good idea for me to do the research and write up my line of authority. The source of the power of the priesthood is God, who works through the Holy Ghost. To have the Holy Ghost direct us in using the priesthood, we must keep the commandments and live worthily. Power in the priesthood comes to us only from our Heavenly Father through the Holy Ghost. With the power of the priesthood, we can do the Lord’s work; without that power, we cannot. That is as clear as can be. I’ve experienced the truth of this principle throughout my life. “If we live for it, ours can be a power given us from our Heavenly Father that will bring peace to a troubled household. Ours can be a power that will bless and comfort little children, that will bring sleep to tearstained eyes in the wee hours of the morning. Ours can be the power that will bring happiness to a family home evening, the power to calm the unsettled nerves of a tired wife. Ours can be the power that will give direction to a confused and vulnerable teenager. Ours, the power to bless a daughter before she goes on her first date or before her temple marriage, or to bless a son before his departure for a mission or college. Ours, my young brethren, can be the power to stop evil thoughts of a group of boys gathered together in vulgar conversation. Ours can be the power to heal the sick and comfort the lonely. These are some of the important purposes of the priesthood” (H. Burke Peterson, in Conference Report, Apr. 1976, 50–51; or Ensign, May 1976, 33). A beautiful, endearing paragraph. What can be sweeter and more tender to a mans heart than comforting his children, or blessing his wife? That is to say, one part of obtaining power in the priesthood is a decision to want or desire power; one is invited by the Lord to ask, seek and knock for such power. Young men who hold the priesthood of Aaron, may I offer an “I will” for your serious consideration? It is I will become very well acquainted with the noble prophet Nephi through studying, pondering, and feasting upon the first two books of the Book of Mormon. My young friends, I promise that when you come to really know Nephi, you will be so impressed with his determination, courage, and desire to be obedient to the “things the Lord commands” that you will have a strong desire to incorporate his attributes into your own lives. Then when you are tempted by the adversary, as you may be nearly every day, to deviate from the counsel of the prophets, the wishes of your parents, or what “the Lord commands,” you can immediately have the words of stalwart Nephi automatically come to your mind: “I will go and do the things which the Lord hath commanded” (1 Ne. 3:7). And when someone with whom you associate suggests you participate in something that is not as “the Lord commands,” you can think of the courageous plea Nephi made to his elder brothers: “Let us be faithful in keeping the commandments of the Lord” (1 Ne. 3:16). Have you ever seen Mitt Romney in an interview? He is sharp, very well spoken, and confident, dare I say Presidential. But he cannot win the GOP nomination. Why do I say that? Too many Right-Wing-”Christians” to be exact. These “Christians” who put Bush into office will not tolerate a Mormon to be President. The anti-Mormon campaign…”LDS are not Christians”…has proven a very effective marketing campaign of the so called “Christian” community. Non-LDS Christians will not put their faith, money, and vote behind a member of a “cult”. They have been fully brainwashed to distrust all-things-LDS. The bias of all-things-LDS runs too deep for them to overcome. This is true because of the nature of their shallow evangelical mindset, theological errors, and especially their anti-intellectual blinded-by-the-faith-of-bigotry perceptions. Given that sad reality, Romney will not win the GOP nomination. We will not have a Mormon President until God brings forth the Political Kingdom of God, which can only happen after America fully implodes from within, meaning, the end of the federal and state government. Only then will the America, and the rest of the world, ready for a Mormon to lead them politically. As I have been reviewing Professor Jones’ paper for part 4, I have come across two articles that, taken together, have done this already and from what I’ve read so far, they’ve done a much better job than I could ever dream of doing, so rather than rebuilding the wheel, I’ll point you to them for a more complete review. The first is an article written by Brent Blanchard, senior editor at Implosion World. The article is located here. I also found another copy of it here. I included both in case either link goes away. These are just the first four out of nine total assertions that are debunked and explained from a professional demolitionist point of view. Mr. Blanchard also says that he spoke to Professor Jones in 2006 about his paper. It’s a good article. Go read it. The second article is by Mike King and it uses the above article as a source as he discusses Professor Jones’ paper. It is here. It is a very good read also. I recommend it. I think I’m done with this topic and I want to move onto another one: seeking truth. In my years interacting with conspiracy theorists and others, I have noticed many traits, motivations, and behaviors that are quite interesting to me. In my next article, I will cover what I have found. It’s interesting because in observing these traits in others, I have been able to identify some of those traits within myself too and have been able to progress as a person as I have tried to get rid of these traits. See you soon! Islamism – An Islamic revivalist movement, often characterized by moral conservatism, literalism, and the attempt to implement Islamic values in all spheres of life. a set of political ideologies that hold that Islam is not only a religion, but also a political system that governs the legal, economic and social imperatives of the state according to its interpretation of Islamic Law. Islamists thus demand the return of the society to Islamic values, and the return of the state to sharia law. A society governed by Islamic principles and law is seen as the true and sole answer to problems caused by the realities of modern life, including social and cultural alienation through urbanisation and migration, and political and economic exploitation. Also known as Militant Islam or Radical Islam. Romney for President Exploratory Committee, Inc.
Don’t you just love egg nog? Me too. For part 3, I would like to tell the story of what happened when I went to one of Professor Jones’ presentations at UVSC (Utah Valley State College) that was held on Wednesday, 1 Feb 2006, at 7:00 pm. UVSC is about a 15-minute drive from BYU. At the time of this presentation, I had already had email interaction with Professor Jones, as described in part 2. I knew that there was going to be a question and answer period at the end of the presentation, so I typed up the best question I could think of: Why demolish WTC 7 when it was going to fall down on its own anyway? And then I provided the testimony of the firemen and the transit data, etc. that I covered in part 2. In preparation, I also printed up our entire email conversation and made notes as to questions I might ask him during his presentation. I sat down in the middle of the audience and they announced that the question and answer period would be at the end and that Professor Jones would not be taking any questions during the presentation. Oh, and the questions would be written and handed in, reviewed, and then given to Professor Jones. Cool – I already had mine typed up, so I handed it in and sat back to soak in the content of the presentation. I was annoyed by the number of times “WTC 7 wasn’t even hit by a jet” and “no other steel high-rise has ever collapsed because of fire” were repeated, but I got over that. He brought more political and religious information into his presentation than he does in his paper. I’m ok with people having an opinion on political and religious issues, but when billed as “Professor Jones – physicist”, I expected more material that deals with his area of expertise. I saw one slide that had the infamous photo of the “column cut at an angle” on it. Professor Jones said that it’s still under investigation but the message I got as he talked about it was that this was one of the core columns that was cut with thermite at an angle so that the building would come down. The people all around me were full of “ooh’s” and “aah’s” and were just giddy about how this was surely the smoking gun that would blow the cover off the official government story. I believe it was at this point that I figured out that I was probably in an audience of mostly “true believers” of government conspiracy theories. Well, I had seen that diagonally cut column before but hadn’t really looked into it. Since then, I have. It turns out that excavation crews cut steel columns at a diagonal because the melting steel runs down, pre-heating the cut so that even though it’s a longer cut, it cuts faster. I then found this page that has other columns being cut at a diagonal by excavation personnel. This is what bothers me so much about conspiracy theorist methods. They dig deep enough to find something that looks like it matches their beliefs but then they stop digging. Did they go so far as to ask an excavator if that would be a normal cut? Did they Google around to find the page that the photo in question originally came from? So, I think it was scheduled to be a two-hour presentation with a lot of time for questions at the end. Professor Jones was going into detail about how the government went around telling people that the air at ground zero was safe to breathe when it really wasn’t – fair enough – put those people in jail. He seemed to be picking out whatever he could to sell the audience on the idea that we couldn’t trust the government and so there was one more reason to believe in a demolition theory. I thought this was going to be about physics. He took up so much time talking about all of this other non-physics stuff that he only left a few minutes at the end for questions. There was a guy reading through the questions and handing them to Professor Jones. Mine was on an 8 1/2″ x 11″ paper and the rest were on quarter page sheets, so mine stood out. It contained details about the firemen testimony and so it was longer than the other questions, but it was still only about a quarter page of text. I watched the guy reading through my question and handing Professor Jones other questions over and over again until they were out of time. It was a bit frustrating. So I went up afterward and got my printed question from “the question guy” and went up to Professor Jones and waited for him to get done talking to some people who were also asking questions. It was finally my turn to talk to him. At this point, Professor Jones didn’t know who I was and that I had been conversing with him via email. This was the first time we had seen each other face to face. I told him about the various firemen testimonies of severe damage to WTC 7 and the transit data and how they had set up a collapse zone hours before it collapsed on its own. I read a lot of testimony to him. He said – no lie – “I don’t think there was that much damage.” What? I said that these were firemen standing at the base and inside of WTC 7 on that day telling us what they saw. I asked him on what basis did he think there wasn’t that much damage. We were being rushed out of the room at that point since others had reserved the room. I think my head exploded again in the car on the way home – I can’t remember for sure. I didn’t hear from him for several months after that until about two months ago when he contacted me again asking if I had any other unresolved issues with his paper. It was a bit strange. I asked him a few questions about chain of custody and he replied with a partial chain of custody that didn’t include dates or names. I then asked him a few more questions and gave him new links to video and photos of the badly damaged south side of WTC 7. He didn’t respond. I sent it again. No response. I received delivery receipts for both emails and so I’m pretty sure he got them. So, that was a strange story, eh? It left me puzzled about what was going on in his mind to so flatly reject relevant testimony about the condition of WTC 7. It does go against the demolition theory and he’s heavily invested in that theory being true but I don’t know if that’s what’s causing him to ignore this testimony. Hopefully, he’ll reply again and I’ll find out what’s going on. In part 4, I will go through the current version of his entire paper and bring up any other unresolved issues I see. I’ll be posting that soon. See you then. Bush says more troop strength needed to deal with Iraq, Afghanistan, ‘long struggle against radicals, extremists’. During the month of November 2005, Professor Jones and I went back and forth via email about the contents of his paper. His paper has been updated since then so I have gone through our discussions and I have only kept the parts of them that still pertain to the current version of his paper located here. All page references below refer to the current version of the paper as of the date of this post. Item 1 – On page 9, there is a photo of what Jones asserts is evidently “now solidified metal” that used to be molten. It turns out that this photo is of cement and other materials, including paper, that are part of several floors of material that were compressed during the collapse. Here are two of the original photos with the caption that explains what it really is. So even though NIST explicitly states that they have found no evidence that WTC 7 was demolished, it seems to me that Professor Jones states that they neglected addressing controlled demolition and that the reason for this is that they were tightly regulated. I would think that being regulated would mean that you don’t say anything about demolition even if you had found something, not that you lie and say the opposite of what your findings are. I think that they weren’t lying and that they really didn’t find any evidence of demolition and by saying so, they did in fact address the issue. Apart from this, there is firsthand testimony gathered from firemen and rescue personnel during the few weeks after 9/11 during debriefing interviews. Several links to these interviews posted at www.nytimes.com can be found here. Some of this information also comes from www.firehouse.com. In summary, the firefighters at WTC 7 say that there was a huge 20-story tall hole down the south side of WTC 7 that went inside the building 1/4 to 1/2 of the depth of the building, there was a large bulge between floors 10 and 13 that they put a transit on to measure its movement to predict collapse potential, there were strange creaking noises coming out of WTC 7, the building was leaning to one side, they saw from the structural damage combined with transit and laser doppler vibrometer data (another tool used to measure collapse potential) that the building would soon collapse on its own. They set up a collapse zone a couple of hours before it collapsed to let it fall. Once it fell, they went back in to work on the debris pile. There are photos and video of the severe damage and smoke billowing out of the entire south side of WTC 7 here and here. I have never seen these photos or video in a demolition theory presentation. I was only shown the basically undamaged north side and a small part of the southwest corner that’s damaged. I think they do this to create a need to investigate a demolition theory in the first place. Maybe I’m wrong though. Maybe they just didn’t look hard enough for evidence that would go against investigating a demolition theory. Perhaps NIST had access to all this information and saw that a demolition theory was not necessary and that is why they didn’t address it except to say that they didn’t see any evidence of demolition. I have sent Professor Jones the testimony above about the severe damage to WTC 7, for example, but I have yet to find that information in his paper. Why would he exclude this important testimony about the state of WTC 7 from his paper? I don’t know either. I also heard Professor Jones during an interview with Alex Jones saying that there was little damage to WTC 7 and that was AFTER I gave him the above testimony and references. Like I said, this testimony makes a demolition theory not necessary and perhaps that is why it is ignored. These statements are misleading in a few ways. First, with regard to WTC 7, yes, it wasn’t hit by a plane, it was hit by a huge chunk of the North World Trade Center Tower that did the damage explained above. Also, that other steel high rise buildings haven’t collapsed like the towers (and WTC 7) did that day is interesting but mostly irrelevant. The example photos of buildings falling on their sides in his presentations and other buildings that withstood fires were built differently and were not hit by airplanes or other buildings in combination with fires. There is also the Madrid Windsor Tower that is often used to show that a huge raging fire didn’t destroy a building, but only selected photos are used. Look here to see the photos the conspiracy theorists don’t want you to see. Yes, if you look at the side of the building they don’t show you (that’s a recurring theme) the steel collapsed but the cement remained at the Windsor Madrid tower. The floors of the towers expanded with fire across three floors. These floors buckled (as is shown in photos) because they couldn’t push the core in or the outer walls out. Once they buckled, the load was transferred to adjacent floors and also through the hat truss to the core. As each floor buckled, more load was put on the core until a global collapse initiated. The outer walls buckled inward up to 55 inches before the collapse, just as his computer models predicted. His models took about 50 minutes to collapse completely and the temperatures were fairly low. The puffs come from the damaged area of WTC 7 as seen in the above photos and video of the south side. The penthouse falls into the building and then we see puffs of debris coming out of the windows in regular succession. It wouldn’t surprise me to see puffs of debris coming out of a building that has already started to collapse. Even the regularity of the puffs wouldn’t surprise me. If these were explosives, not only would they be seen before the building starts to fall (I saw the building start to fall one frame before the first puff came out – perhaps I’m looking at a different video), but they seem to be in the wrong place. Why put them at the top edge of the building? Also, why are we calculating floor to floor pancake times when WTC 7 didn’t pancake according to video accounts. The floors were connected to each other and a shock wave through the floors would go as fast as the speed of sound in the materials it was traveling through. With the penthouse dropping before the puffs, why is it such a mystery that air pressure from within the building as it collapsed would want to escape out of the already broken windows? Anyway, this really is moot since the collapse was expected hours before (without demolition), according to the firemen on the scene. That’s a true, but misleading statement, especially when you know what the whole quote says. How can you do a probability calculation on an event with such an incredible amount of unknowns? Did Ryan input the amount of core damage that was done into his statistical calculations? If so, where did he get that data? If not, where did he get his numbers? Could you provide me with the inputs and the formula used to come up with that number? Was an airplane flying into those core columns part of the calculation? He didn’t get back to me on those questions. I really think it smells funny to put a “one in a trillion” estimate out there with no calculations to back it up. Apparently, Mr. Ryan didn’t know about the damage to the south side of WTC 7 that gave the firemen the idea that the probability of collapse was close to 1 in 1. He also apparently didn’t know about Dr. Asif Usmani’s work that put the probablilty of collapse of the towers at some number quite a bit less than a trillion to 1. If you combine those two probablities, you get a more likely overall chance of the three buildings collapsing. Yeah, I don’t know the exact probability, but it seems that Mr. Ryan doesn’t have all the inputs, including the firemen testimony above, or it would seem to be less than a 1 in a trillion chance. As we might expect? Who is expecting this? Exactly what type of concrete were the floors made out of again? What amount of energy would it take to convert that into dust? Is there a more reasonable explanation than explosives all over every floor? I think so and I think I’ll believe people who knew what kind of concrete was used and actually did calculations to find out what would happen. Look here if you dare. I just watched video of this again and the upper floors remain intact all the way until they disappear into the cloud of concrete dust below them. I don’t know which video he was watching. Even if it did turn into dust because of explosives, how on earth would you do that without having fire or other explosive evidence other than just dust? And don’t say nukes – even Professor Jones doesn’t buy the nuke or the “high energy particle beam” theories. I disagree. How would cutting core columns on lower floors cause a collapse of the building directly above the impact but not just below the impact? How would it cause the south tower to tilt and rotate above the impact point but not below? Why would it not fall from the ground floors straight down? And how on earth does a physics professor make an assertion that the plane crashes “were actually a diversion tactic”? What? Um, where are your physics calculations for such an assertion? I think that statement gives us a glimpse into his underlying beliefs that could be driving him to reject any data that goes counter to that belief. I could be wrong though. You decide. Regardless of the reason that he put this in his paper originally, it stinks like anti-war agenda bias and it weakens his objectivity. Could it be just another glimpse into his underlying belief driving what I think is his practice of pathological science – where his underlying belief drives the types of data he looks for? I don’t know either. You decide. I think if these samples are real, that this is really where Professor Jones’ time should be spent. It’s in his area of expertise and it’s physical evidence. My only problem is that since his theory amounts to charging our own government with large scale cold blooded murder, his chain of custody (or provenience) needs to be better than this. I believe he has more detail for his chain of custody but I haven’t seen it published yet. I would like to see the names, dates, and locations of each sample from ground zero all the way to his hands. That is what would be required for a murder case. If the chain of custody isn’t bulletproof, then it could be argued that someone just gathered up some slag from a thermite experiment they did in their back yard and sent it to Professor Jones and that would be the end of his case. Next up, I would like to describe his reaction when I came to one of his presentations with firemen testimony in my hand. It was very strange. I would also like to go through his current paper and address any new information he has added since my last review of it. Just to reiterate, I am not here to beat up on Professor Jones or to just do anything I can to prove him wrong. I think he should do the research he’s doing and I think his findings should be published. I do not however think that his solid research dealing with physics and metal samples should be hidden in a sea of already debunked or questionable or misleading material. This would end up being a bunch of red herrings for the government or others to pick at – like I’m doing right now. I’d like these inaccuracies and misleading items to be reworded or removed so that the focus can be clear and solid and if there was something fishy going on on 9/11, it can be discovered. PBS Program Reminder: Sweetwater Rescue: The Willie and Martin Handcart Story: A documentary about British immigrants in 1856 who make a 1300-mile journey on foot from Iowa City to Salt Lake City, and the story of the people who try to rescue them when they lose their way. I’m proud to announce Robert Cronk as a new author on LDS Patriot. Welcome, Robert! Robert is a software engineer from Utah who loves programming computers (for the last 28 years), playing volleyball and practicing martial arts (both for the last 8 years), creating techno music (www.mp3.com/cronk), raising his family, and researching random events such as 9/11. He uses the basic logic skills he has learned throughout his years of programming to search through sets of information and sift out the truth and error in an objective and unbiased way. He feels strongly that people need to walk in each other’s shoes and find common ground in order for a constructive discussion to occur. His motivation in publishing the information he has found is to put an objective, unbiased point of view out there that is not tied to a theory but to the evidence itself regardless of the theory it supports and regardless of the consequences of a particular theory being true or false. In his research, he has found very few voices out there that are not heavily vested in a theory being true and he thinks people deserve to hear an objective voice. When people adhere strongly to a theory, they end up twisting and filtering evidence to match that theory and that path rarely leads to the truth. He is open to all current theories about 9/11 and is also open to all current theories being false. From the first Arab-Islamic Empire of the mid-seventh century to the Ottomans, the last great Muslim empire, the story of the Middle East has been the story of the rise and fall of universal empires and, no less important, of imperialist dreams. So argues Efraim Karsh in this highly provocative book. Rejecting the conventional Western interpretation of Middle Eastern history as an offshoot of global power politics, Karsh contends that the region’s experience is the culmination of long-existing indigenous trends, passions, and patterns of behavior, and that foremost among these is Islam’s millenarian imperial tradition. The author explores the history of Islam’s imperialism and the persistence of the Ottoman imperialist dream that outlasted World War I to haunt Islamic and Middle Eastern politics to the present day. September 11 can be seen as simply the latest expression of this dream, and such attacks have little to do with U.S. international behavior or policy in the Middle East, says Karsh. The House of Islam’s war for world mastery is traditional, indeed venerable, and it is a quest that is far from over. 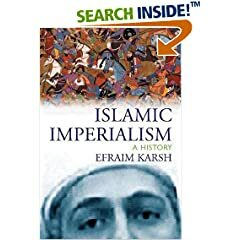 In Islamic Imperialism, Karsh poses a fundamental challenge to the way we understand the history of the Middle East and the role of Islam in that region. Efraim Karsh is professor and head of the Mediterranean Studies Programme, King’s College, University of London. He has published extensively and often served as a consultant on Middle Eastern affairs, Soviet foreign policy, and European neutrality. His books include Empires of the Sand: The Struggle for Mastery in the Middle East, 1789-1923 and Saddam Hussein: A Political Biography. Posted by permission from Dr. Daniel Pipes. Its appearance is independent of this blog, and should not be construed to either agree or disagree with the opinions expressed on this blog, or on any other website. The Iraq Study Group Report, cobbled together by ten individuals lacking specialized knowledge of Iraq, dredges up past failed U.S. policies in the Middle East and would enshrine them as current policy. Most profoundly, regarding the American role in Iraq, the report moronically splits the difference of troops staying or leaving, without ever examining the basic premise of the U.S. government taking responsibility for the country’s minutiae, such as its setting up public works projects. Instead, the report unthinkingly accepts that strategic assumption and only tweaks tactics at the margins. A preposterously lengthy list of 79 recommendations lies at the heart of the report. These include such gems as bringing in the (Saudi-sponsored) Organization of the Islamic Conference or the Arab League (no. 3) to decide Iraq’s future. Another creates an “Iraq International Support Group” that includes Iran, Syria (no. 5), and the United Nations secretary-general (no. 7). Other brilliant recommendations call for the UN Security Council to handle the Iranian nuclear problem (no. 10) and for the support group to persuade Tehran to “take specific steps to improve the situation in Iraq” (no. 11). Right. The Iranian regime, whose president envisions a “world without America,” will save Washington’s bacon. Such counsel smacks at best of what the Jerusalem Post calls “staggering naïveté” and at worst of ghastly foolishness. 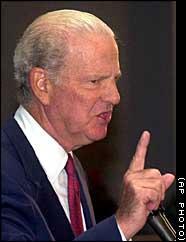 Of course, small minds assert that problems in Iraq are “inextricably linked” to the Arab-Israeli conflict – thereby repeating the precise mistake that lead co-chairman James A. Baker, III, made in 1991. He then led the effort to abandon the Persian Gulf and turn to the Palestinians, leaving Saddam Hussein in power for another dozen years and contributing directly to the present mess. In the new report, Mr. Baker and his colleagues call for a Palestinian state (no. 12) and even demand that a final settlement address the Palestinian “right of return” (no. 17) – code for dismantling the Jewish state. They peremptorily declare that “the Israelis should return the Golan Heights,” in return for a U.S. security guarantee (no. 16). Besides the astonishing conceit of these Olympian declarations, one wonders how exactly the Iraqi civil war would be ended by pleasing the Palestinian Arabs. Or why the unresolved Arab-Israeli conflict is any more relevant to Iraq than the unresolved Azeri-Armenian conflict, which is closer to Iraq. To make matters worse, Mr. Baker had the nerve to admonish the Bush administration not to treat the report’s 79 recommendations “like a fruit salad,” choosing one idea while rejecting another, but to accept it as a whole. Even in Washington, a town famous for arrogance, this statement made heads turn. That Mr. Baker and his co-chairman, Lee Hamilton, sat for a picture spread with famed photographer Annie Liebovitz for Men’s Vogue, a fashion magazine, only confirms the vacuity of their effort, as does their hiring the giant public relations firm, Edelman. In all, the Iraq Study Group Report offers a unique combination of bureaucratic caution, false bi-partisanship, trite analysis, and conventional bromides. Although the press reacted to this drivel, in the words of Daniel Henninger writing in the Wall Street Journal, with “neurotic glee,” Robert Kagan and William Kristol deemed it “dead on arrival,” and Iraq’s president, Jalal Talabani, called it “dead in the water.” One hopes they are right, that President George W. Bush ignores its recommendations, and that this “new lipstick on a very old pig” (Spencer Ackerman) quickly disappears from sight. That’s not to say that Mr. Bush should “stay the course,” for that course has not worked. A host of creative ideas have been floated by individuals knowledgeable about Iraq, sympathetic to the administration’s goal of building a free, democratic, and prosperous Iraq, and not tempted to see their role as an exercise in preening. The White House should call on these talented individuals to brainstorm, argue, and emerge with some useful ideas about the future American role in Iraq. Doing so means breaking with a presidential tradition, going back at least to 1919, of what I call a “know-nothing” Middle East diplomacy. Woodrow Wilson appointed two completely unqualified Americans to head a commission of inquiry to the Levant on the grounds, an aide explained, that Wilson “felt these two men were particularly qualified to go to Syria because they knew nothing about it.” This know-nothing approach failed America 87 years ago and it failed again now. Lone wolf? Muslim or non-Muslim? Just last week I mentioned to two colleagues it seems only a matter of time when someone targets shopping malls. CHICAGO – A man was arrested Friday by federal agents on charges of planning to set off hand grenades in garbage cans at a shopping mall. Derrick Shareef, 22, of Rockford, was arrested when he met with an undercover agent in a parking lot to trade a set of stereo speakers for four hand grenades and a handgun. Federal officials said he planned to set off four hand grenades in garbage cans at the CherryVale shopping mall in Rockford, about 90 miles northwest of Chicago. WASHINGTON, Dec. 6, 2006 – The report issued today by the Iraq Study Group offers an opportunity for government leaders to come together and work toward a solution in Iraq, and the administration will take the report’s recommendations very seriously, President Bush said here today. Members of the administration and Congress won’t agree on every proposal put forth in the report, Bush acknowledged, but added that this is an important opportunity for leaders to work together for the good of the country. He thanked the members of the commission for their work, noting that they have made a vital contribution to the U.S. and the future of Iraq and the Middle East. 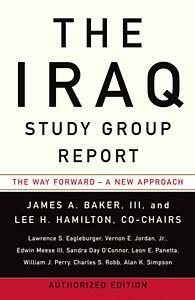 The 10-member bipartisan Iraq Study Group is co-chaired by former Secretary of State James Baker and former Congressman Lee Hamilton. The group’s report will now move to Congress for consideration. When considering the facts this video brings to light, it’s clear these Muslim imams are liars. In short, they setup the entire “discrimination” charade as a tactic to shame American’s for thinking suspiciously about suspicious behavior. Last week, six Muslim men were removed from a plane in Minneapolis. They claimed to be victims of “discrimination.” Do you know the WHOLE story? If not, please read the police report and eyewitness reports from the incident before you make up your mind. Poll question: Would you vote for a Mormon for president? Sung to the tune of Jesus Wants Me for a Sunbeam, here is an old time Jihadist favorite, Allah wants me for a Jihadist! I’ll be a Jihadist for Him. His little bomber can be. And always terrorize for Him. Then live with Virgins on high. Scholars for 9/11 Truth collapse. Steven Jones gets the boot. Did Steven Jones get kicked out of Scholars for 9/11 Truth? It appears to be so. Poor homeless Steven Jones, abandoned by BYU. Now his homies at Scholars for 9/11 Truth do not want Steven Jones anymore either; apparently he got kicked out of Scholars for 9/11 by Fetzer. Scholars for 9/11 Truth has imploded. Click here to read the start of the major fight between Fetzer and Jones which caused the schism. It is so absurd, bizarre, conspiratorial, unprofessional, moronic and demonstrative of the extreme dysfunctional nature of the group and its star individuals that it comes as no surprise Scholars for 9/11 Truth have imploded. Or did the Government cause the schism and ultimate collapse using thermite? Did I mention Jones work is to be published in a political opinion book and not a science journal? And when questioned about that reality he refused to answer and changed the subject. Manuel Garcia Jr, physicist and engineer, presents his three separate reports, undertaken for CounterPunch. Part One is his report on the Physics of 9/11. Part Two (published here for the first time) is his report on the Thermodynamics of 9/11. Part Three, “Dark Fire“, is his report on the collapse of the World Trade Center’s Building 7. Broz, thanks for the post. Your right about the epithet “The Great Satan,” made famous by Ayatollah Khomeini in the Iranian Revolution. Satan in not an imperialist. Satan is a tempter. Sayyid Qutb writings are one of the main references for jihadists today. Prager wrote an article denouncing Ellison’s use of the Koran to take his oath of office. I disagree with Prager, and believe Ellison has every right to use which holy book he wants. While I am no fan of multiculturalism and political correctness, I am adamant about the principle of Freedom of Religion. The 11th article of faith of The Church of Jesus Christ of Latter-day Saints reads: We claim the privilege of worshiping Almighty God according to the dictates of our own conscience, and allow all men the same privilege, let them worship how, where, or what they may. Until Arabs give up their effort to eliminate Israel, a cease-fire is all that Israelis can hope for. From the Rhodes Armistice to the Egypt-Israel treaty to the Oslo accords to the 2003 hudna, each respite in warfare has been temporary. Cease-fires benefit Israel in two main ways. They end the killing and they offer the time for Israel to improve its war-making abilities. But these cease-fires invariably come to an end, warfare resumes, and Israel must again fight and win before a new cessation of hostilities begins. Each cease-fire, in other words, contains the seeds of its own demise, each war contains the premise for the next lull. All that said, the instant and multiple violations of the most recent cease-fire makes it unlikely to have much staying power.